A plastic dog crate makes an affordable, durable, hygienic and portable 'den' for your puppy or dog. Plus they're almost a 'magic wand' when it comes to house training, and the most popular (and airline preferred) option for air travel. If you've just brought a puppy, or dog, into your family.. a crate (often also known as a dog kennel) is one piece of equipment you don't want to be without. There are many different designs and brands on the market. Large pet stores often stock a variety of the small/medium sizes, but the large/x-large-giant ones can be difficult to find. There are lots of things to consider when choosing a plastic dog crate for housebreaking/general use and for air travel. To make it a little easier for you I've put together a selection of some of the best plastic dog crates available. Petmate products are made by the Doskocil Manufacturing Co in Texas. and this popular brand offers one of the widest range of crate/kennel styles on the market - and are consistently among the most popular choices with pet owners in the USA. A plastic dog crate is the best choice to use when crate training your puppy because it's sturdy, easy to clean and the least-expensive option. There are several different styles to choose from, each one carefully designed and with a range of well-thought out design options to suit specific needs. Not all dog crates are created equally in terms of the features they have, or the purpose they're best suited for. A crate for housebreaking needs to be easy to take apart and put back together, easy to clean, portable and sturdy. If you're looking for a dog crate that Fido is going to be using for air travel then size requirements and design needs are much more specific. Although a crate which has been specifically designed to be used for airline travel can usually work well for house training, the reverse is often not the case. The Petmate range of plastic dog crates has several great choices for house training puppies and small dogs. The X-small Petmate Vari Kennel is a sturdy plastic dog crate with vents side and rear plus both clip latches and corner wingnuts to hold top and bottom securely in place. Features an interior 'moat' which you absolutely need when potty training because it catches urine and keeps the center floor area (and consequently Fido) much dryer. Easy-squeeze door latch, easy-to-clean design, seatbelt loop (for added in-car security), carrying handle and built in treat compartment on top. One year limited manufacturers warranty. Measures 19"L x 10.8"H x 12.3" W and is suitable for pups/dogs up to 10lbs in weight. Available in neutral Bleached Linen color and also in five other sizes including 24"L and 28"L models. 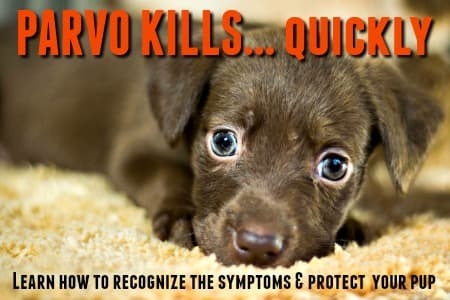 the 24" size is also for small dogs (up to 20lbs in weight) and the 28" size will work for dogs up to 30lbs in weight, which would be considered small/medium. The Petmate Fashion Vari Kennel is another sturdy, durable crate with all the features of the Vari Kennel above, plus a choice of two attractive color combos - Pearl Raspberry/Black and Pearl Peacock Blue/Black. Also has a one year limited manufacturers warranty. Available in two sizes for small pups/dogs, 19"L (for dogs up to 10lbs) and 24"L (for dogs up to 20lbs). Both the Petmate Vari Kennels are airline approved but you need to check specific size and other requirements with your airline before traveling. Many airline approved crates are only suitable for a pet traveling in the cargo hold as they don't fit under the seats in the main body of the plane. In addition to the Vari Kennel crates there are some other good choices, each with slightly different features/designs/sizes. 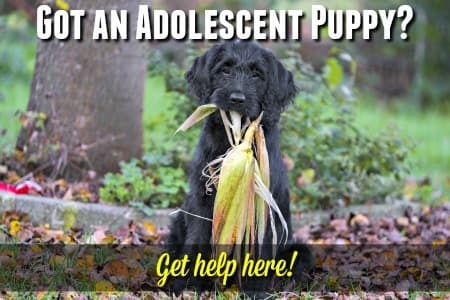 As this is an important piece of equipment, and you'll be using it a lot (and most likely buying more than one as your pup grows) it's worth taking your time choosing so that you get the best fit for your needs, at the best price you can. Petmate Two Door Top Load 24"
For airline travel choose the sturdiest crate you can afford which is airline approved and is confirmed to meet IATA regulations, which include suitable crate dimensions, ventilation, documentation, labeling, food and water and more. Click on this link for the IATA dog crate requirements for airline travel. Dog crates that are manufactured with air/car travel in mind tend to be a bit narrower (and often a little taller) than all-purpose crates. This is to help prevent your pup from being thrown around while the car/plane is in motion. It also means that they take up less floor space. Of course these types of crates/carriers can still be used for house-breaking, but keep an eye on that growing puppy to make sure he doesn't get cramped without you noticing! If you have a small puppy or dog and are planning on taking him inside the main passenger area of the plane your options for plastic crates are limited. However, soft crates are available in a variety of designs, styles and sizes and many of them fit the dimensions required by airlines. But no matter which crate you choose, you MUST check with the individual airlines you're using to be sure that it meets their specific regulations! Petmate Kennel Cabs are the ultimate in safety and comfort for your airborne pup. Constructed from durable but lightweight molded plastic (25% recycled material). Fully airline-approved and conforms to International Air Transport Association (IATA) regulations. Complete with secure, but easy open/close latches and door locking system, small storage compartment on top (handy for treats, paperwork, leash etc.) and seatbelt slot for safe car travel. The Petmate Sky Kennel meets the requirements of most airlines. Made in the USA from 25% recycled materials, door with secure four-way latching system, sturdy heavy-duty nuts and bolts and plenty of air vents for Fido's comfort. 'Live Animals' is printed on the outside of this dog crate. The IRIS Deluxe Pet Travel Carrier meets IATA requirements and comes in three sizes (XS, S & M). A plastic dog crate for your medium, large or extra-large dog needs to be super-sturdy and easy to clean. Crates of this size can only travel in the cargo hold of airplanes and the large/X-large/giant versions need a good sized SUV if you plan on using them for travel. 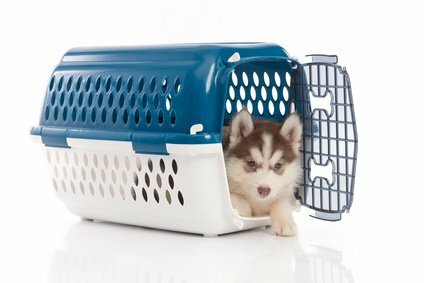 Airline approved crates work fine for housebreaking, and vice versa, but if you're only planning on having Fido use his kennel at home you don't need to shell out for the most expensive and durable design (unless he's Houdini). A great fit for this category is the Petmate Vari Kennel Ultra, a 'new-and-improved' version of the classic Petmate Vari Kennel. Constructed from light, high-density plastic (95% pre-consumer recycled material) this dog crate works well at home and is the perfect crate-training tool and comfy 'den' for your dog. It's also sturdy and comfortable enough to be used for car/air travel (medium to large size dog crates travel in the cargo hold) and is airline approved. This 'Ultra' version comes complete with sturdy steel door with 'squeeze-latch' handle/lock, metal grid side air vent panels, interior moat, plastic-and-non-corrosive metal heavy duty 'Fast-Nut' hardware for securing top and bottom sections, extra tie-down holes around door to allow for extra zip-tie security if necessary.. and more. The Petmate Sky Kennel is one touch crate, but at an affordable price - and it's the perfect way to keep your puppy or dog safe and sound en-route to his destination (whether it's by road, rail or air). Made from heavy-duty, extra-strong plastic with sturdy steel door, metal wire side air-vents and extra ventilation cut-outs in rear. 'Squeeze-latch' door handle (3 largest sizes have a 4-point locking door for added security), plastic and non-corrosive metal wing nuts, leak-proof bottom and the words LIVE ANIMALS printed on the exterior of the shell - this plastic dog crate is ready to go anywhere.